Question: How do I clear the download history list in Firefox? 1) Click on ‘Tool’ located at the top menu bar in Firefox. 2) Click on ‘Downloads’ in the drop-down menu. 3) Click on the big ‘Clean up’ button at the bottom of the pop-up window. Now you have successfully deleted all of your download history. 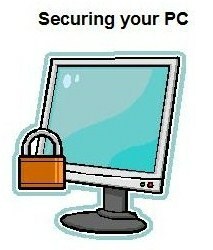 Protecting your PC is very important especially in the modern days. Now, if you are a Mac user, you might laugh at Windows users about them having to worry about viruses and spys. But the truth is that you do not have to do a lot to secure your PC. Of course if you want extra protection or if you own a large business, you might want to look further. So lets start with the basics. The operating system you are using may largely affect the security of your computer and also what steps you have to take. For example, if you compare Windows Vista with Windows 2000, the difference is huge. For users of Windows ME and 98, I really recommend you to upgrade. You do not have to have Vista but something like XP would be fine. Or even better, why not reward yourself with a new PC. You can get quite a good PC at a very cheap price these days. So as I said before, the operating system you are using greatly affects what you have to do to secure your PC. The next thing you should care about if what Security Suite you are going to use. For XP, 2000 and 98 users, I recommend getting the top performance security suites. I recommend NOD32 and also Kaspersky. For a detailed security suite comparison, click visit Tech Centre or Top10 Reviews. They both do a great job and unlike Norton, they do not slow down your PC very much. If you are using Windows Vista, then you are rewarded for getting the newest and safest operating system. All you actually need for Vista a very light weight and average security suite. I currently use Windows Live One Care which is not highly rated but I find it just fine. Paul Thurrott who is a Windows expert uses the free edition of AVG anti virus combined with Windows Defender that comes standard on Vista. (You can also download Windows Defender for XP) In addition, AVG also have their own anti-spyware program which is free. In addition, PC Tools has got a great free Anti-Spyware Program that comes with Google Pack. I have been using it for nearly two years and so it is the best Anti-Spyware program I have ever used. As you can see that you do not have to do a lot in Vista. The web browser you use to surf the web is very important too. I always recommend to use the latest version of a web browser. Firefox 2.0+ is a little safer than Internet Explorer 7 and you can even go further with Firefox by installing security add-ons. Both of them have a phishing filter which I think is a got to have feature) I mainly use Firefox and occasionally use Internet Explorer 7. But probably the biggest factor that will affect your security is you. What you browser on the net and your behaviour is extremely important. Try to avoid going to bad sites and be suspicious when opening an email or attachment from a sender that you do not know. Having a firewall is also a must. Both Windows XP and Vista have a standard Firewall when purchased (It is called Windows Firewall). Windows Firewall does a good job and is free. But nearly all Internet Security Suites have their own firewall to give you extra protection. In addition, it is very important that you install the required Windows Updates for your PC. To ensure that you do not forget to keep up with updates, turn on ‘Automatic Updates’. This will automatically update your PC without you having to do anything. To find out how to turn on auto-updates or see if you have auto-updates on, please click HERE. (This article maybe edited for improvements and updates) If you have any Security tips and recommendations, please leave a comment. Stay tuned for the next article: Security Suite Comparison. Question: I need to frequently or daily visit a particular website. Is there a way in which I can easily access a particular site at the click of a button? Answer: Yes, you can set up some links and place them in your web browser for easy access. For Internet Explorer 7 users: Once the website you want to link has been loaded, add the website to your favourites under the ‘Links’ folder. 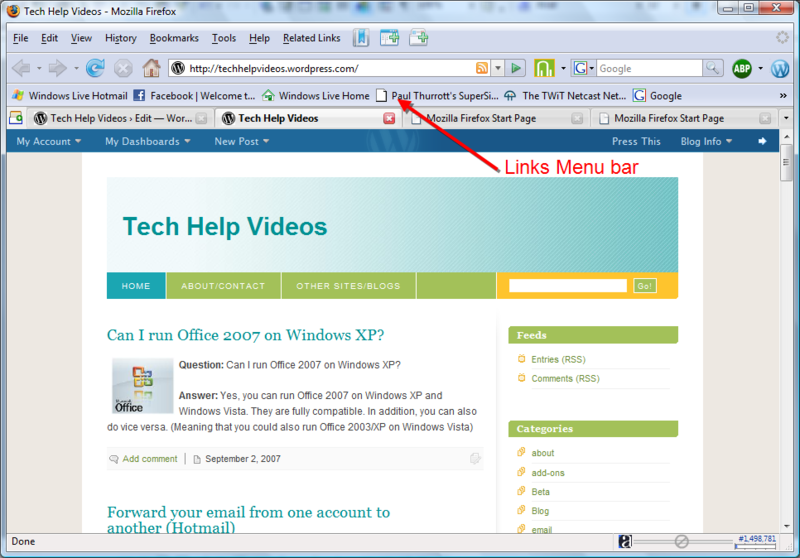 (You now should be able to see the link that you have created on the Links Bar at the top. 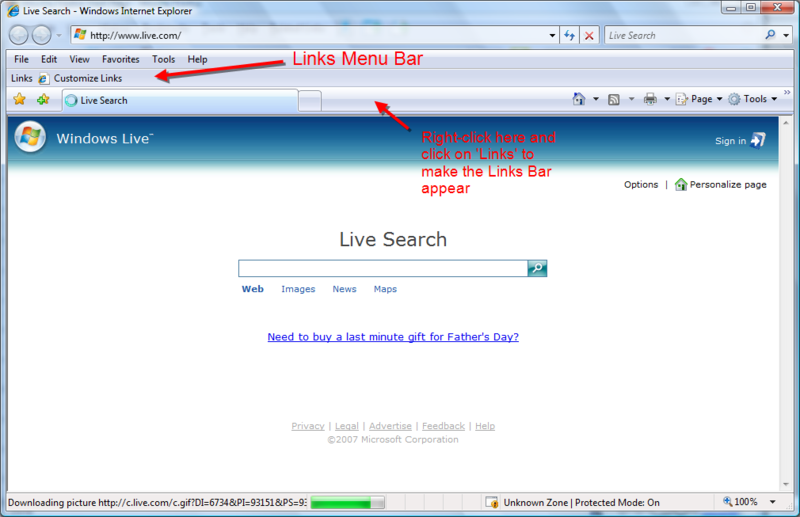 If you do not see the links bar, right click on the tabs bar underneath the menu bar where you type the URL. In the drop-down menu, click on links. For Firefox users: Once the website you want to link has been loaded, drag the title or logo of the site to the Links Bar. (The Links Bar is just underneath and menu bar where you type the URL) After dragging the website name/logo, you should see a short phrase that will direct you to that particular website when you click it.